Two weekends ago, Canberra played host to Auto Italia 2007, Australia’s foremost annual show of Italian automotive machinery. Organised by the Italian Cars Association of the ACT, Auto Italia is an annual display of Italian cars, bikes and scooters aimed at promoting Italian automotive machinery. Held continuously since the early 1980s, the event has steadily grown to become the premier Italian automotive event in Australia and one of the largest worldwide. It attracts considerable interest both within the ACT and interstate enthusiasts, with people making the trek this year from as far away as Victoria and Queensland to partake in the festivities. Italian music and coffee help to set the tone for the day – a celebration of Italian cars as well as culture. 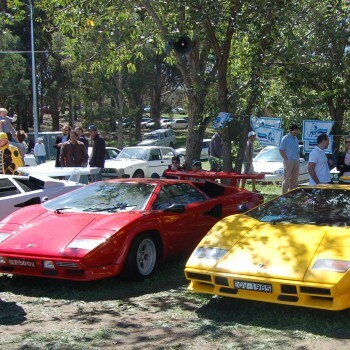 Held on March 25th in its traditional location of Grevillea Park, on the shores of Lake Burley Griffin, the show’s featured marque this year was Lamborghini. This drew enthusiastic support from owners with over thirty cars making an appearance, running the gamut of Lamborghini’s output from the 1960s to the present day. Amongst the models represented were the Miura, Urraco, Jarama, Espada, Countach, Diablo and Gallardo, as well as the latest release from the factory, the Murciélago LP640. Organised by the Italian Cars Association of the ACT, Auto Italia is an annual display of Italian cars, bikes and scooters aimed at promoting Italian automotive machinery. 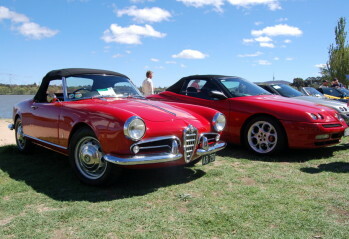 Two weekends ago, Canberra played host to Auto Italia 2007, Australia’s foremost annual show of Italian automotive machinery. Auto Italia 2007 also featured a celebration of the Lambretta scooter’s sixtieth anniversary, as well as the Fiat 500’s fiftieth anniversary. With the launch of the all-new 500 now mere months away, the show provided a great opportunity to revisit this icon of the automotive world, and recall its enormous influence on shaping the nature of motoring in Europe. With the new 500 due to debut in Australia at the Sydney Motor Show in October, crowd enthusiasm for these cheeky little cars remained high. Part of the reason for Auto Italia’s status as the largest event of its kind in Australia is its openness to any Italian car, bike or scooter, be it new, restored or just a runabout. Although prizes are awarded, the event is not conducted as a “Concorso d’Eleganza”, and entrants are not required to be members of the Italian Cars Association, or indeed any other club. Moreover, with the reintroduction of Fiat to the local market last year, and the appearance of a few Grande Puntos amongst the classic Fiats on display, the signs bode well for Auto Italia to capitalise on increased interest for all things Italian and automotive next year.